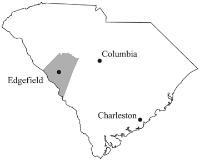 Edgefield County, where Dave lived most of his life, is located in central South Carolina, near the Georgia border. The county seat is the town of Edgefield, which was incorporated in 1785 to serve as the center of justice for that part of the state. 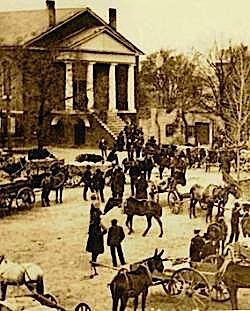 The fine brick courthouse shown here was built on the town square in 1839 and still serves the population today. The square is a kind of outdoor assembly hall equally ready in former times to receive the crowds that came for court days and the wagons that brought goods to market. Then, the surface of the square would have been red with the clay that gives this area of South Carolina a distinctive look, but today a neat green sward covers all but the paved street around the perimeter. Less bucolic than the village greens of New England, less elegant than the squares of Savannah, it is workmanlike and direct, much like the people who originally settled the town. The buildings facing the square, mostly one and two stories tall, are generally not impressive. A trio of disastrous fires at the end of the nineteenth century destroyed most of the original wooden structures, and these plain replacements are all of sensible brick. Their finest feature, ironically, is this simplicity: They provide the setting for the courthouse, the town jewel. Edgefield was once a center of political power. Ten governors of the state have come from there, the most recent being Strom Thurmond. Through its influence on the course of South Carolina history and through South Carolina’s subsequent influence on the course of the nation's history, Edgefield is considered one of the most historically significant communities in America. This mention of Dave at the center of town is both a tribute to him and a place to begin to recapture his story. Close by, at 101 Courthouse Square is the Ferrell Museum, where a splendid collection of Edgefield pottery is on display; a few steps farther on at number 104 is the Tompkins Library and Welcome Center, where books on Dave are for sale; behind the library (at 230 Simkins Street) is the Old Edgefield Pottery, where potter Steve Ferrell creates fine stoneware vessels in the style of those made here long ago. Edgefield was once the center of Dave’s life. He drove through it in wagons loaded with pots he had made and poems he had written. Through the passing of time and the discarding of uncomfortable memories, much of his story was lost. Vivid traces of it can be found in this town where history remains close to the present. Information on this page is condensed from Carolina Clay: The Life and Legend of the Slave Potter, Dave by Leonard Todd (W.W. Norton, Fall 2008). The 1912 postcard detail at the top of this page is courtesy of the Edgefield County Historical Society. The map of South Carolina is by Jo Ann Amos Graphic Design. 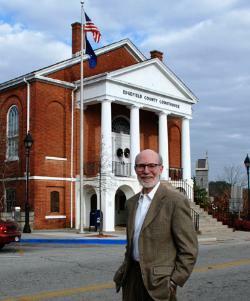 The photograph of the author in front of the courthouse is by Tricia Glenn.